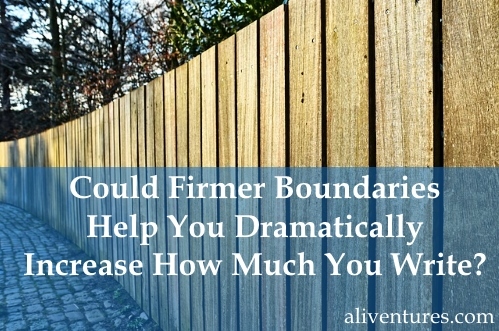 Could Firmer Boundaries Help You Dramatically Increase How Much You Write? Back when I was a student, I had long vacations. Sometimes, I’d attend my previous writing group, back in my home town, where members would bring about 1,000 words of their work-in-progress to read each Monday evening. Guess how many words I wrote each week? About 1,000. It took me the whole of a Monday, sometimes, in fits and starts. These days, with two kids and housework (on top of freelancing commitments), I can easily hit 1,000 words in an hour. What’s the difference? Stronger boundaries. When my fiction writing has to fit between 5.15 and 5.45pm, then (usually!) I sit down and focus for half an hour. I don’t tidy my desk, stare into space, sharpen my pencils, scroll through Facebook, or potter around doing housework. I just dive straight in. Time boundaries, where you have a firm starting and ending point: you write in your lunch hour, for instance, or you write from 6pm – 7pm while your partner prepares dinner. 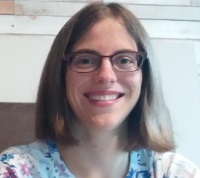 Rule-based boundaries like “no social media during my writing hour” or even “switch off the internet connection during writing times”. You can also use these to protect certain days or times for writing: for instance, “no client calls on Mondays or Tuesdays”. People-based boundaries, where you shut the door to your room and tell others not to introduce while you’re writing. I’ve found boundaries hugely helpful. Like everyone, I’m tempted to procrastinate … and I’m not always as focused as I’d ideally like to be. If I’ve had a disturbed night with the kids, I’m particularly prone to getting distracted. But boundaries make it much easier. They put a structure in place that means I can spend my energy on the actual writing – not on simply generating the willpower to write! When you create a boundary, you’re making a one-time decision that saves you having to think about a particular choice every time you write. For instance, if you decide that you always switch off your internet connection when you’re drafting fiction, it’s a fairly easy rule to stick to. There are an awful lot of boundaries you can create that only affect you. I find physical boundaries particularly helpful. I’m drafting this in a local cafe, and have written almost 1,000 words in the time it’s taken me to drink my decaf cappuccino. All I need to do here is write. Someone else made the coffee … and someone else will wash up. There are no clothes to wash, beds to make, or toys to pick up. There is wifi, but I’ve deliberately switched off the wifi receiver on my laptop! I’m sitting upstairs (where no-one else ever bothers sitting unless downstairs is totally full) – so I haven’t got the distractions of other people’s conversations. This doesn’t simply mean I get more done than I do at home. I can write a blog post in a similar length of time when I’m at my desk. However … it feels a lot less effortful. I’m not making a constant choice to resist distractions: there’s simply nothing to resist. How about you? Could you get out occasionally and write somewhere that’s as distraction-free as possible? If you’ve never done this before, you might be surprised just how much difference it can make. You may want to combine this with a time boundary – either one that’s already a fixed part of your life (like picking up a child, or visiting an elderly relative), or something that you can schedule in with a friend, like a lunch appointment. Over the past few years, I’ve gotten a lot better about setting boundaries in my relationships with others. For instance, I no longer feel obliged to take on every request to write a free guest post or take part in a blog interview. I’m much more comfortable saying “no” to requests to help out in various ways at church (I also say “yes” to quite a few … but I have firm limits on how much I’ll take on). If you tend to take on too much, in order to help or please people, try saying “no” more often. It’s really important to preserve your time, energy – and indeed sanity! – so you can still write. Writing is not selfish, self-indulgent, or a waste of time. At the very least, it’s a leisure activity. Everyone is entitled to spend at least some of their time doing things they enjoy. Other people have the right to ask for favours. You have the right to say no. Just because someone sends you an email or message does not oblige you to respond. In almost every situation, you are not indispensible. Even if someone is disappointed that you said “no” to them, they will find a way to manage without you. How you’re going to minimise the possibility of interruptions while you write. Could you give your phone to your partner and ask them to answer it if it rings? Can you shut the door to the room where you write – or even lock it! – so your children don’t intrude? How you’ll fit writing time into your week. If you’re a freelancer, blogger, or someone who makes a living from writing and writing-related work, you might want to set aside specific days (or half-days) for meetings and calls – keeping others clear for your writing. Of course, other people can also help you create and maintain good boundaries around your writing. For instance, you might find a friend or small group to write alongside for a specific period of time. I did this a couple of weeks ago with a friend – we sat across a table from one another in our local cafe, chatted about how our writing was going, then wrote in companionable silence for 45 minutes. You don’t have to do this in person, either: you could easily set up an online writing session. Some of my Writers’ Huddle members are doing this with me on Wednesday evenings, currently, from 8pm – 9pm. We get together in our members’ chatroom, say a quick hello and explain what we’ll be writing … then we go away and write! Of course, your writing won’t always fit within neat boundaries. Sometimes, you’ll want to have an open ended session where you can dive deep into your writing without having to stop short. Other times, you might want to have an afternoon or a day when you play around with your writing – allowing distractions to occur as part of the creative process. Some of my best ideas have come from idly reading the news online, or browsing Quora. But if you’ve not got many – or any – boundaries around your writing at present, think about introducing some this week. Drop a comment below to let me know what you’ll be trying (and don’t forget to come back and tell us how you got on). Thank you for this! Great article. It’s exactly what I needed. My problem is giving myself permission to write. I can think of ten other things I ought to be doing, like cleaning the bathroom or paying bills. And I love spending time with my family, but I should be able to retreat to my room for an hour a day without seriously neglecting anyone. As for my demanding cat, well, he’ll just have to be satisfied with sitting beside me, rather than on me, while I type. I think a lot of writers (especially those with a family) have the exact same problem: there are always so many other things to be done, it can be really difficult to feel “allowed” to write. I’ve quite often heard people say that they’ve been more productive when time has been limited than when they’ve had loads of free time. And parents always wonder exactly what they did with all their time before they had children. Mine are at school all day, but time still seems to be very limited once all the chores have been done. I’m trying very hard to use the big chunks of time for writing work, and fit the chores into the times of the day when I’m tired or only short time is available. I can’t now work out why I felt busy before I had kids…! That sounds like a good plan with chores. They’re never-ending, aren’t they?! 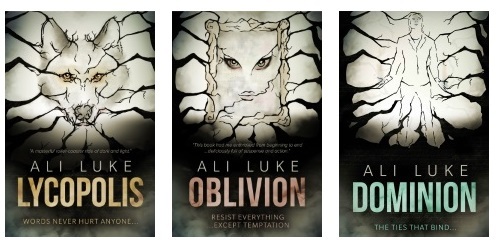 Hi, Ali. Boundaries are difficult for me, a natural people pleaser who cringes at the thought of disappointing someone to the point of them raising their voice. Sometimes when I see no way out I forget that I can move. Seriously. I can leave the house to do my writing and no one will melt like the witch in O.Z. My next writing appointment will be in the garage with the door locked and a do not disturb sign. That sounds like a great idea, Sara! I’m not going into the office, probably won’t write new material, might get some housework done (this is such a novel activity, it can qualify as a diversion).